13 different clubs competing over the weekend. 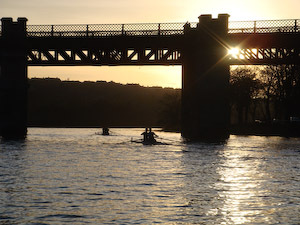 79 crews entered on Saturday and 104 small boats on Sunday. With a variable headwind and a strong stream, times were slow this year. Umpires, helpers and competitors all helped to run the events (mostly !) to time. There was inevitable congestion on the landing stages between divisions but the tide stayed adequate for everyone to use the full course. This event marked the first presentation of our new medals designed by Douglas Cameron of ABC. 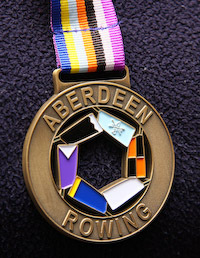 It features the blades of all Aberdeen rowing clubs and even the ribbon is made up from all the colours featured on Aberdeen blades.